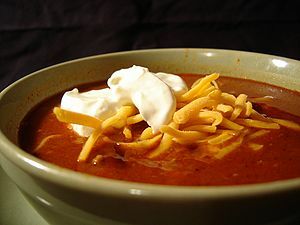 The Superbowl is just around the corner and who doesn’t love Chili while watching football? This is a fairly simple recipe, the slow cooking and letting sit over night or 2 days before serving really does the hard work for you! I can not eat spicy foods, so the amounts of ingredients listed below will produce a mild Chili with a slight kick. You can easily spice it up for those wanting to have sweat pouring from their forehead, I give options so it is up to you if you wish to use them while cooking or as toppings for the mixed crowds. If you have a Crockpot or SlowRoaster Chili is perfect for that kitchen tool. You can set it to low and leave alone or over night, with the occasional stirring and tasting. If you don’t have one, no big deal, use a large pot with a cover on the stove over med-low/low heat for several hours. There are basic ingredients and optional ingredients. The basic ingredients are a must as they build the base and flavor for the chili. The optional and toppings, beans, corn, more spice, etc.. This makes about 6 – 7 quarts, make sure you have a 7 qt or larger pot/cooker. You can make the whole recipe and freeze in smaller portions, or reduce by half. The beans, corn or other items you add will add more bulk and increase the volume of the chili, so be sure to gauge what you add so your pot is big enough. If you start to over flow, move to 2 pans/pots. Salt and Black pepper to taste. Hold off on adding salt until near the end. When increasing the amount of heat, keep in mind, the longer you let it simmer, the more heat is released. So if you think it is still mild after making the below adjustments, wait before adding more. Let it simmer 1.5 – 2 hours before adding more heat. It has a funny way of sneaking up on you. If you have a slow cooker/crockpot that has a stove top safe insert, all the steps can be done in that one pot. However, if you do not, then you will need to use a large pot for the browning of the base ingredients. In a pan/pot on the stove, heat over med-high heat and add the vegetable oil. Once the oil starts to shimmer, add in the onions, carrots, celery, green pepper and canned green chili. Sauté, stirring every few minutes to cook and brown the vegetables. Once the vegetables are soft and starting to brown, add in the garlic and any hot peppers if using. Sauté for about 3 minutes until the garlic softens. Keep an eye on it and stir it as garlic can burn quickly. You can lower the heat if needed. Add in the ground meat and break up and brown. Add in about 2 tsp of ground black pepper. Once the meat is browned and ingredients are mixed together, add in the tomato paste and stir and cook for about 3 – 4 minutes. Add in the beef broth to degaze the pan. If you are using a separate pan for the stove top portion, then now is the time to transfer the ingredients to the slow cooker. Now the fun part – adding the rest of the ingredients. Add in the tomato sauce, diced tomatoes, beer stir to combine. Now add in all the spices/seasoning ingredients (still hold off on the salt). Stir to combine. Add in any other ingredients you are going to use corn, beans (either canned or pre-soaked and cooked) stir well. You can taste, unless something really off-balance, don’t adjust just yet. Bring to a good simmer over med heat and let simmer for 30 minutes. Check it and stir every 5 – 10 minutes at first to prevent burning or sticking to the bottom while using this heat level. After about 30 minutes, reduce the heat to low or med-low heat. check it and stir every 15 minutes for the next hour. NOW taste. Here is where you can adjust your seasonings. Do you need a pinch of salt? A pinch more sugar? Not spicy enough? you want more beans? or changed your mind and want more corn? Keep in mind the heat level will continue to increase over night. You can always have extra diced peppers or hot sauce as a topping or side for those who wish to have it. Now put it on low and just let it go for another 2 hours or more, stirring every 30 minutes or so and tasting as you do. I am always full by the time it is ready for serving. When you are satisfied with the flavors, thickness, etc.. turn off the heat and serve or let it cool to room temp before putting it in the fridge. The next day is when it will taste best. If you are making for a party, it is best to make it the day before, then about 3-4 hours before serving to guests, put it back in the slow cooker/pot and bring to a simmer on med-low/low heat to reheat. Stir about every 30 minutes. When serving, keep it on low heat and put out all the yummy sides. I love sour cream and cheese with mine. The onions add a nice crunch. Posted by culinaryease on December 23, 2011 in General Cooking, Parties, Appetizers, and More, Recipes, Vegan/Vegetarian and tagged Beef, Chile powder, Chili, Slow cooker, SlowCooker, vegetarian chili.